What is Mistletoe? Should I be Concerned if it's in My Trees? Here in the Central Texas area, mistletoe is found mainly on hackberry trees, cedar elms, and red oaks. Mistletoe is a parasite, and although it makes its own food through photosynthesis, it roots into the vascular system of the host tree and removes minerals and water from the host tree for its survival. It can be especially draining on trees weakened due to construction stresses or during droughts. If not removed, mistletoe will stay with the host tree until the tree or the limb it is on dies. It is important to note that mistletoe only spreads from seed. It does not move through the host tree’s vascular system and send out new plants. If it is broken off, it will grow back from the existing roots in the same place. Mistletoe reaches seed in 3 years. Therefore, if we are removing it every two years, it cannot reach seed and cannot spread. Since mistletoe is much more common and often much more severe on cedar elms than it is on red oaks, and since cedar elms are an extremely widespread and valuable tree in this area, we are often removing it from these trees as part of our pruning regimen. If stressed cedar elms have major infestations, we are often removing the mistletoe every few years in conjunction with fertilization and mulching/watering programs to re-invigorate the trees over time. We have slowly nursed many severely mistletoe infested and stressed cedar elms back over the years. It is important to note, however, that if there are mistletoe infested cedar elms on neighboring properties, that re-infestation can still be a problem due to the spread of new seeds into the maintained trees due to birds. Birds eat the seeds and then deposit them into new trees. Squirrels can also move them around on their fur since the seeds are extremely sticky. Mistletoe infestations can often result in swelling and subsequent weakening of tree limbs due to tissue scarring. This is also an aesthetic issue as the trees can become quite unsightly over time. As of right now, there is no product on the market that can be sprayed on mistletoe that kills the roots. There are defoliants such as Florel that can be applied, but they are expensive, have very high mix rates, and can only be applied is the winter or they will defoliate the tree as well as the mistletoe. Dr Tom Watson, a Texas Agricultural Experiment Center urban forest researcher at College Station, has been working on a study using a plant hormone to control mistletoe (including the roots) with promising results. If successful, the product could be patented for use throughout the United States. 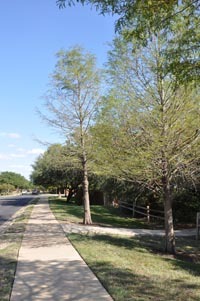 https://centraltexastreecare.com/wp-content/uploads/2015/06/austin-tree-care1.png 0 0 Andy Johnson https://centraltexastreecare.com/wp-content/uploads/2015/06/austin-tree-care1.png Andy Johnson2012-05-22 15:56:542012-05-22 15:56:54What is mistletoe and should I be concerned if I have it in my trees? Vine removal in Austin trees What is oak wilt?